Yesterday morning Jen's mum and sister left in a selfish act that now leaves us as the dual caretakers of the Wombats. What can I say. Some people only think of themselves. Before they left they allowed the boys to play with an heirloom stuffed wombat that I understand is not a toy and can never be allowed to be touched by baby hands again. 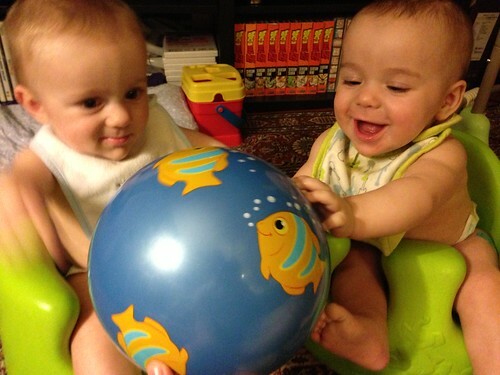 Apparently it is a rare stuffed animal that is not waterproof and can be destroyed merely by the breath of a baby. 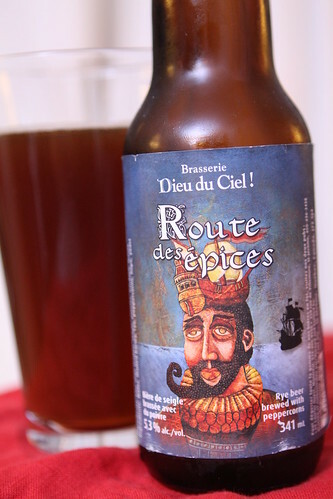 Last night I enjoyed a beer from Quebec brewer Dieu du Ciel!, this Routes des Epices. It was a very nice beer brewed with peppercorns which had a naturally spicy finish to it. We're going to Montreal in a matter of days so this was a nice warm up to the upcoming trip. Today, after picking up the guys from day care I did my best to entertain them between FaceTime calls to their grandparents before they lost their minds and could not longer put off dinner. The guys were hungrier tonight than I have ever seen them. I made what I thought was an obscenely large amount of spinach with multigrain cereal and a splash of formula and they housed it in no time. After they ate Elliott was sort of freaking out and babbling, presumably trying to explain to me and his brother how he was nowhere near done eating. In eating it they made the biggest mess I have witnessed to date. Elliott compounded this mess by rubbing his mouth with the back of his hands then immediately rubbing the entirety of his chubby little head and face. After dinner they both had an unprecedented ten ounces of forumla each. I was really hesitant to continue feeding them for fear that they would erupt. 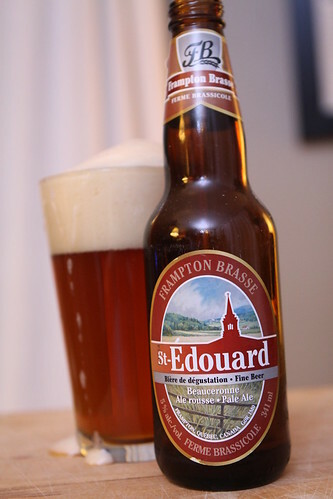 After getting them to bed I cracked open this St-Edouard from Frampton Brasse, another Quebec brewery. This is the last in the series of Quebec beers my father-in-law brought me from his most recent visit. This was quite enjoyable and very lively. I suspect it may have over-fermented a bit but that doesn't bother me a bit. This brewery is apparently named after the town of Frampton outside Quebec City and, sadly, not for the 70s talkbox master. With that in mind I leave you with the man himself showing you the way. Baby, he loves your way. By the way. I can't handle that amazing video! too amazing!!! they're like Penn & Teller, if Teller were a drolly silent man with a curly mustache made of spinach.